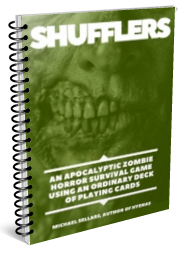 Shufflers is a zombie horror survival game for 1 player and up that, if you have a deck of playing cards to hand, is completely free. You just need to read the instructions on this page or download and print-out the free PDF (just click on the image below). You don’t need dice, a calculator, pencil and paper or any of that stuff. Just a deck of ordinary playing cards. The basic rules are for a single-player game of chance. There are also rule modifications to introduce an element of strategy and to allow for competitive or collaborative multiplayer game play. If you share the rules of this game with anyone, I’d really appreciate it if you could cite me, Michael Sellars, as the original source, preferably with a link back to this site. Thanks. Deal a row of Diamonds faceup, Ace to 10 in front of you. This is your Ammo supply. Deal a row of Hearts faceup, Ace to 10 in front of you. These are your Health Points. Remove the Jokers and set them aside for the moment. Split the remaining cards into two equal piles, add a Joker to each. Shuffle each pile and then add them together and place the deck face down in front of you. There is now a Joker in the first half of the deck and a Joker in the second half of the deck. This is your Encounter deck. The game is over when you draw the second Joker. The first Joker represents your arrival at the coast, the second represents finding a working boat and escaping the shuffling horde. These are the living dead, the zombies, the Shufflers. The number represents the number of Shufflers encountered. And how many bullets will be needed to stop them. You draw the six of Clubs. That’s six Shufflers coming at you. You’ll need six rounds to put them down. Discard the six of Diamonds from your Ammo supply. If you’ve already discarded that card, you’ll have to lose cards that add up to that value (e.g. a four and two). If you don’t have any cards adding up to that exact value, round up. It’s a cruel world. Help! I’m out of ammo! You now start depleting your Health Points, discarding from your Hearts deck. You draw the seven of Spades. That’s seven Shufflers lurching toward you. You only have an ace and a four of Diamonds (i.e. five rounds). You discard the remaining Diamonds and also the two of Hearts. You are now unarmed. Any further Shuffler encounters come out of your Health Points deck. Keep your Ammo and Health Point discards separate. As with Ammo, if you don’t have the exact value in Health Points, you’ll have to round up. Once you’re out of Health Points, you’re dead. But not for long. You’ll soon lurch to your feet and join the shuffling mindless horde! If you draw a Queen, you’ve encountered a doctor, who patches you up. Retrieve the last Heart card you discarded and add it back to your Health Points pile. If there are no discards, simply ignore and discard. You’ve just stumbled across a survival nut/prepper, who furnishes you with ammunition. Take back the last Ammo card from the Ammo discard pile. If there are no discards, simply ignore and discard. Every apocalypse creates its human monsters. Jacks represent the thieves, bandits and marauders. Discard the highest value Ammo card. Put this to one side, not in the usual Ammo discard pile. Stolen Ammo cannot be retrieved. If you don’t have enough Ammo, take the highest value Health Points card instead. This represents the thief making off with your food, water or medical supplies. The first Joker means you’ve arrived at the coast. The second Joker means you’ve found a boat and have won the game. When you deal yourself a King or Queen, instead of retrieving your last Ammo or Health Points card, you can take the ‘Vehicle Option’. In which case, you deal and discard the next two cards from the Encounter deck, effectively speeding up your journey. You are gambling on the value of your most recent discards (Ammo or Health Points, depending on the card drawn) being of lower value than the next two cards. If one of those cards is a Joker, it still signifies your arrival at the coast or the commandeering of a boat (i.e. you’ve won the game). If you draw Kings, Queens or Jacks, they are ignored. When you deal yourself a King or Queen from the Encounter deck, instead of retrieving your last Ammo or Health Points card you can take the ‘Sacrificial Lamb’ option. In this case, you can immediately discard the next Shuffler card you draw as it makes a meal of your latest ‘comrade’. You are gambling on the value of your most recent discards versus the value of the next Shuffler. To play Shufflers as a multiplayer game, simply use one deck of cards per player and play in parallel, taking turns. The winner is the first to get to the boat. Drawer cards to see who goes first. Highest card wins, aces are low. Use one deck per player (combined into a single deck) but only two Jokers, one in each half of the pack, as usual. During each round, each player draws an Encounter card. Shuffler numbers are combined but every player can expend (discard Ammo) to take the Shufflers down. This allows for more accurate shots and less ‘stray rounds’ (i.e. having to round up). Neil, Rik and Vivien are playing. Neil draws the three of Clubs, Rik the seven of Spades and Vivien the four of Clubs. That’s 14 Shufflers. Neil only has two rounds of Ammo. Rik and Vivien discard a nine and a five respectively. Neil keeps what little Ammo he has. They can now move onto the next round. For Queens and Kings, it is generally wise to bestow the benefit on the most needy. For Jacks, it makes sense to identify the player with the lowest high value card and have the thief make off with their stuff. When a player is nearing death (i.e. down to just a few Health Points, they can sacrifice themselves for the good of the group. If they take this option, the next Shuffler card is discarded without effect and any remaining Health Points are donated to the remaining players, as equally as possible. If you want to score Shufflers and compare performances, simply add up all remaining Ammo and Health Points. Hyenas is available in paperback and eBook formats from Amazon. Click here. If you have any suggestions for improvements or new rule modification, please feel free to get in touch.